Most homeowners aren't happy with their crawl space. And there's a good reason for that-- most crawl spaces don't offer much to be happy about. Typical crawl spaces are moldy, foul-smelling spaces that homeowners avoid at all cost. Many of them flood, and they're often filled with debris. At Best Home & Property Services, it's our job to make sure that this unpleasant space is transformed into a clean, dry, and energy-efficient space. We offer more than just crawl space vapor barriers! Our complete moisture control system includes a wide variety of crawl space products for your home. 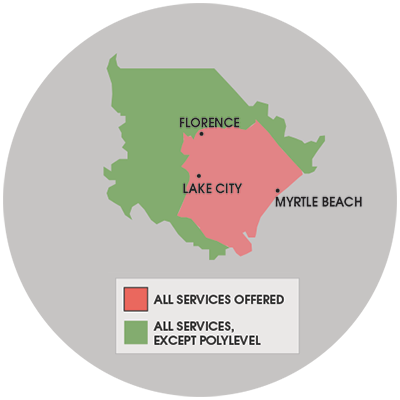 We offer free quotes in North Carolina & South Carolina, including Camden, Florence, Gaddysville, Loris, Marion, Myrtle Beach, Rembert, St. Matthews, Sumter, Tradesville, Trio and nearby! Contact us today for a free crawl space repair quote! !